Background: Spatio-temporal control of extracellular signal-regulated kinase (ERK) activity, a critical determinant of the cell's response to growth factors, requires timely dephosphorylation of its regulatory tyrosine and/or threonine residue by MAPK phosphatases. 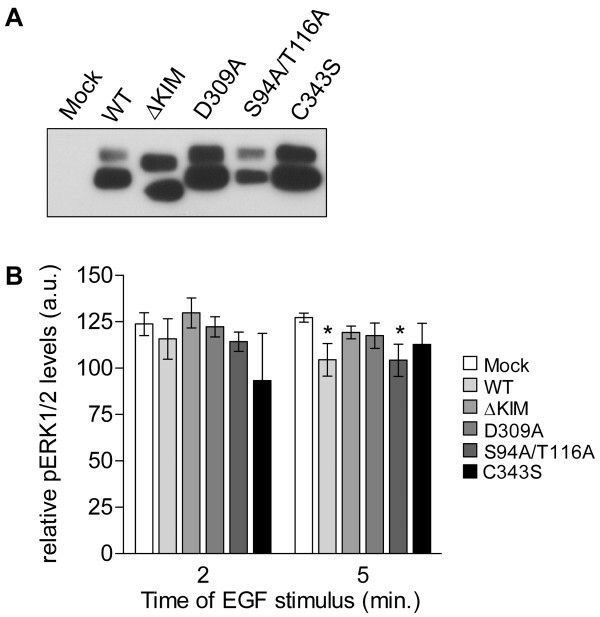 We studied the physiological role of kinase interaction motif (KIM)-containing protein tyrosine phosphatases (PTPs) in the control of EGF- and NGF-induced ERK activity in neuroendocrine PC12 cells. Results: We found a single KIM-containing PTP to be endogenously expressed in rat PC12 cells: the transmembrane PTPRR isoform termed PCPTP1. Protein knock-down of PCPTP1, or fourfold overexpression of its mouse orthologue, PTPBR7, left EGF- and NGF-induced ERK1/2 activity in PC12 cells unaltered. Ectopic expression of cytosolic PTPRR isoforms, however, resulted in reduced EGF-induced ERK1/2 activity, an effect that was dependent on the phosphatase activity and the KIM-domain of these PTPs. Conclusion: The finding that robust changes in tyrosine-specific MAPK phosphatase expression levels have minor effects on temporal ERK1/2 activity control in PC12 cells suggests that dualspecificity MAPK phosphatases may act as major regulators of growth factor-induced ERK1/2 signaling in these cells. One of the best-studied cellular signaling relays is the mitogen-activated protein kinase (MAPK) signaling cascade, the central mechanism by which growth factors steer cellular key decisions such as proliferation and differentiation . It has become clear that it is not just the amplitude but also the spatio-temporal distribution of the MAPK activity within the cell that determines the final outcome of this signaling relay. For example, in the rat PC12 phaeochromocytoma cell line seminal studies have shown that epidermal growth factor (EGF)-induced proliferation relies on a transient activation of the extracellular signal-regulated kinases 1 and 2 (ERK1/2) in the cytosol, whereas nerve growth factor (NGF)-induced differentiation requires a sustained ERK1/2 activation and translocation to the nucleus [2,3]. Thus, not only signaling molecules that activate these ubiquitous MAPKs but also the ones that inactivate and/or localize them are important for determining signaling specificity. ERK activation requires the phosphorylation of two closely spaced regulatory tyrosine and threonine residues by the dual specificity MAP kinase kinases MEK1/2 . Concomitantly, ERK inactivation involves dephosphorylation of these residues by MAPK phosphatases. Although the EGF and NGF specific pathways that lead to ERK activation have been mapped in detail in PC12 cells , the contribution of MAPK phosphatases in this model system has received little attention. The dephosphorylation of ERK1/2 regulatory tyrosine and threonine residues can be achieved by three different phosphatase types: protein serine/threonine phosphatases, dual specificity (serine/threonine/tyrosine) phosphatases (MKPs/DUSPs) and classical phosphotyrosine-specific protein tyrosine phosphatases (PTPs) . The latter two types have gained considerable interest because they contain a so-called kinase interaction motif (KIM) that is also present in the upstream MAPK kinases MEK1/2. The KIM-domain mediates the interaction and in part determines binding specificity towards the different MAPKs [6 - 8]. Importantly, this interaction can be regulated via cAMP because PKA-mediated phosphorylation of a serine residue within the KIM-domain abolishes binding and dephosphorylation of MAPKs [9,10]. Mammals contain three classical PTP families that may regulate ERK activity by KIM-dependent binding and dephosphorylation: HePTP/LC-PTP, STEP and PTPRR (Fig. 1A). The haematopoietic HePTP/LC-PTP was indeed shown, through gene targeting studies, to be a physiological regulator of ERK in lymphocytes  and the striatal-enriched phosphatase (STEP) enzyme family was found to regulate ERK activity in primary neuronal cultures . For PTPRR isoforms current data mainly reflect overexpression studies in non-neuronal cells [6,9,13]. Given that rat PTPRR receptor-type isoform (PCPTP1) mRNA levels in PC12 cells are increased nine-fold within 8 h following NGF treatment , a role in neuronal differentiation induced by sustained ERK activity may be expected. To determine which of the three KIM-containing phosphotyrosine-specific PTPs are endogenously expressed in rat PC12 cells, an RT-PCR analysis on total RNA was performed. Expected amplicons for STEP and HePTP were obtained from mouse cerebrum and mouse spleen RNA, respectively, but STEP and HePTP messengers remained undetectable in PC12 material (Fig. 1B), in concordance with earlier reports [15,16]. For the rat PTPRR gene two different transcripts, encoding PCPTP1 and PCPTP1-Ce, respectively, have been reported [17,18]. PCPTP1 mRNA is present in PC12 cells [14,17,19] but PCPTP1-Ce transcripts remain undetectable in PC12 RNA, although the amplification product is readily obtained using rat cerebellum RNA (Fig. 1B). In mouse the PTPRR-encoding gene generates a third transcript isoform which encodes two additional protein isoforms (PTPPBSγ-42 and PTPPBSγ-37) through the use of alternative translation start sites . To be able to probe for the presence of putative rat PTPPBSγ variants, we searched in public databases for the rat PTPRR genomic region displaying very high homology to mouse PTPPBSγ transcript-specific sequences and designed primers for use in RT-PCR assays. Indeed, the predicted PTPPBSγ-type fragment was amplified from rat cerebellum RNA, while mouse PTPPBSγ cDNA served as positive control, but no signal was obtained using PC12 material (Fig. 1B). Thus, in rat PC12 cells only the largest PTPRR transcript, that encodes the receptor-type isoform PCPTP1, is expressed. As an alternative way to assess the relevance of PTPRR activity for the regulation of ERK signaling, we generated pools of PC12 cells that stably expressed mouse PTPRR isoforms by means of retroviral transduction. Lysates of the resulting cell lines were first analyzed on Western blots to determine PTPRR expression levels (Fig. 3A). Transduction with mouse PTPBR7-encoding viruses resulted in immunoreactive bands that superimposed on those of endogenous PCPTP1, confirming the previous annotation of these signals. Ectopic expression of mouse PTPPBSγ transcripts resulted in two additional immunoreactive bands which represent PTPPBSγ-42 and PTPPBSγ-37 . Cells transduced with a construct encoding PTP-SL, the mouse ortholog of PCPTP1-Ce, failed to display appreciable levels of expression (not shown) and are therefore not included in this study. 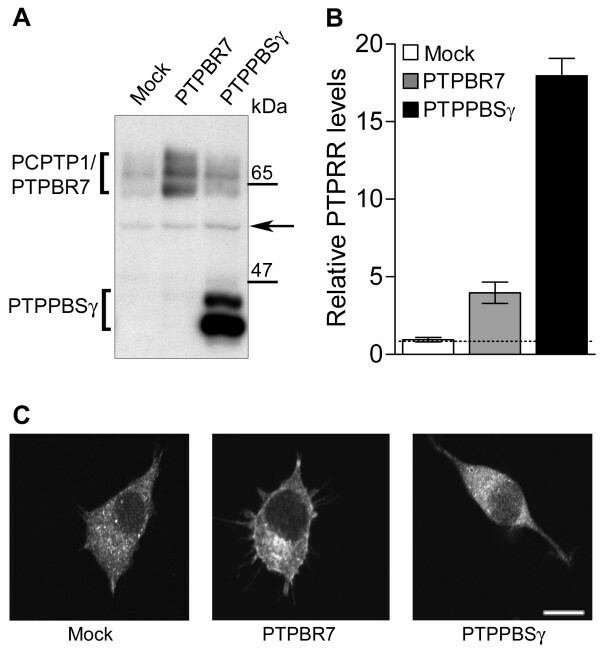 Quantitation revealed that PTPBR7 expression exceeds three-fold the endogenous PCPTP1 level, whereas PTPPBSγ expressing cells show PTPRR levels that are some seventeen-fold higher than in non-transduced controls (Fig. 3B). Analysis of the subcellular distribution revealed that endogenous PCPTP1 displayed a weak vesicle-type of staining in PC12 cells, and only limited cell membrane localization (Fig 3C, left panel). In line with previous data [20,23,24], its mouse ortholog PTPBR7 was detected at the cell membrane, on vesicular structures and at the Golgi apparatus (Fig. 3C, middle panel). Mouse PTPPBSγ isoforms are cytosolic proteins that are excluded from the nucleus, while endogenous PCPTP1 adds a speckled pattern (Fig. 3C, right panel). The binding of KIM-domain-containing phosphatases to their MAPK targets can be abrogated by the cAMP-dependent protein kinase PKA, through phosphorylation of a specific serine residue within the KIM-domain [9,10,12]. Intriguingly, current models on transient versus sustained ERK activation in PC12 cells incorporate an NGF-induced PKA-mediated signaling pathway . To investigate whether this mechanism kept PTPRR isoforms from regulating ERK phosphorylation levels in PC12 cells, we investigated the phosphorylation status of the KIM domain serine residue in immunoprecipitated PTPRR proteins using an antibody directed against phosphorylated PKA substrates. Administration of the PKA activator forskolin was used to determine maximum levels of KIM-domain phosphorylation . Phosphorylation levels of endogenous PCPTP1 in PC12 cells were, unfortunately, below detection level (data not shown). 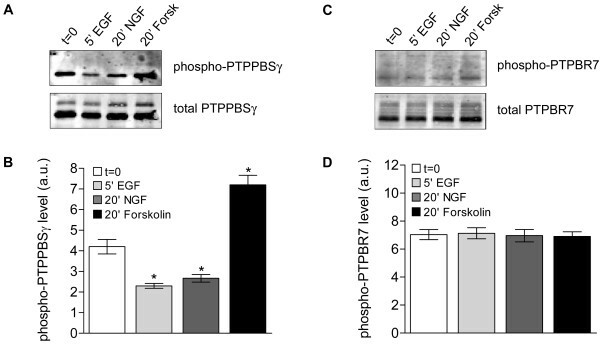 In PTPPBSγ-expressing PC12 cells about half of this phosphatase appeared phosphorylated following overnight serum starvation, and EGF or NGF administration even led to a significant decrease in the phosphorylation of the regulatory serine (Fig. 5A,B). In PTPBR7 expressing cells, however, the PTPBR7 KIM-domain seems maximally phosphorylated under all conditions tested (Fig. 5C, D), which may explain the negative findings regarding ERK1/2 activity modulation by this receptor-type PTPRR isoform. 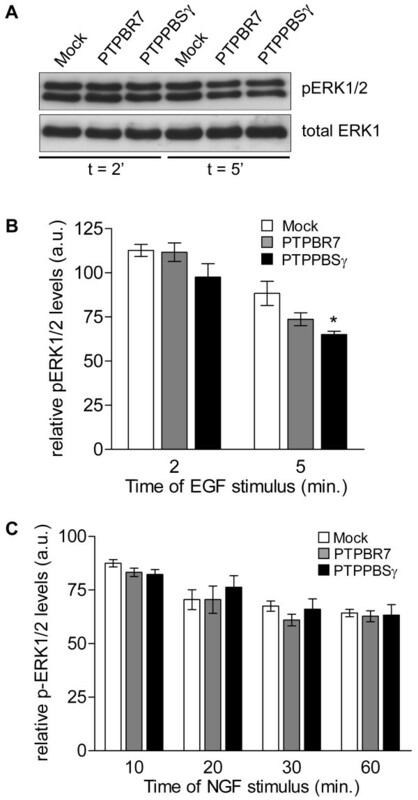 To determine whether the phosphatase activity and/or MAPK binding potential of PTPPBSγ is required for the observed attenuation of the EGF-stimulated transient ERK activity (Fig. 4), PC12 cell pools were generated that stably express specific PTPPBSγ mutants. PTPPBSγ C343S and D309A mutants represent catalytically impaired versions that still may bind phosphotyrosine-containing substrates . In the ΔKIM mutant the KIM-domain has been deleted, making it unable to associate with MAPKs . Furthermore, because phosphorylation is known to regulate its association with MAPKs [9,13], we also included the PTPPBSγ S94A/T116A double mutant in this series of experiments. The PTPPBSγ mutant-expressing cell pools demonstrated expression levels that were comparable with or even exceeding that of wild-type PTPPBSγ expressing cells (Fig. 6A). Again, relative phospho-ERK1/2 levels were determined by phospho-immunoblot analyses. Only in PC12 cells expressing wild type PTPPBSγ or PKA-insensitive PTPPBSγ S94A/T116A a significant decrease in ERK1/2 activity at 5 min, but not at 2 min, following EGF stimulation is apparent (Fig. 6B; p < 0.05). The catalytically impaired mutants as well as the version without the KIM-domain have lost this ability, demonstrating the requirement of a direct association with and subsequent dephosphorylation of the MAPK by the PTP. The neuroendocrine PC12 cell line represents a paradigm model system to study spatial and temporal aspects of growth factor-induced MAPK signaling [2,26]. In this study we made an inventory of the MAPK-associating, phosphotyrosine-specific PTPs that are endogenously expressed in this cell system and tested their physiological relevance for the spatio-temporal control of EGF- and NGF-induced ERK1/2 activity. 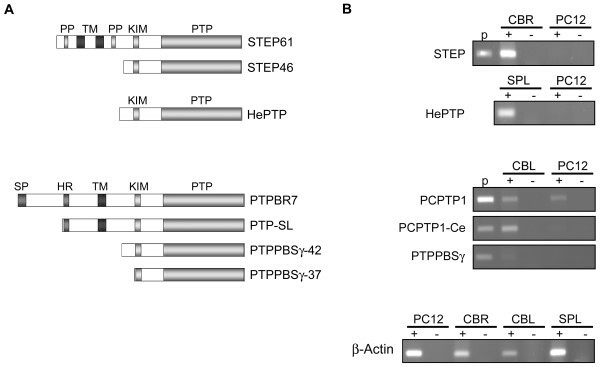 The PTPRR isoform PCPTP1 was the only detectable KIM-domain containing classic PTP in these cells. Knockdown of PCPTP1 protein levels or additional expression of its mouse ortholog PTPBR7, however, left transient and sustained ERK1/2 signaling in response to EGF or NGF, respectively, unaltered. Our finding that in this cell system PTPBR7 was constitutively phosphorylated on a regulatory serine residue within the KIM-domain, precluding its binding to ERK, provides a likely explanation. Ectopic expression of the cytosolic PTPPBSγ isoforms resulted in a decrease of EGF-induced, but not NGF-induced, ERK1/2 activation. This effect required PTPPBSγ enzymatic activity and an intact KIM-domain, pointing to a direct association with and dephosphorylation of the MAPK. In line with this, only some 30–50% of the PTPPBSγ molecules was found to be phosphorylated on their KIM serine residue, leaving the majority available for engagement in ERK binding and dephosphorylation. What other substrate targets for PCPTP1 may exist in PC12 cells to explain its endogenous presence? Besides ERK1/2, PTPRR proteins were shown to bind the MAPK family members p38α and ERK5 [6,9,13,27,29] but these studies were mostly performed in non-neuronal cells, using either recombinant proteins or ectopically expressed phosphatases and MAPKs. Further studies towards the identification of the physiological targets of PTPRR isoforms are therefore needed. In addition, current in vitro studies might be hampered by the fact that potential ligands for the PCPTP1/PTPBR7 extracellular part, which may critically control the activity of the phosphatase, have not been identified yet. Also in view of the restricted expression pattern of the Ptprr gene [17,24,30] and its conserved potency to generate multiple protein isoforms through the use of different promoters, alternative splicing and multiple start codons [18,20,30] it may well be that the tyrosine phosphatase PTPRR family members will prove physiological regulators of MAPK signaling in other cell systems and following different stimuli than the ones tested here. Given the lack of endogenous PTPRR expression in many neuronal cell lines, studies in PTPRR deficient mice are eagerly awaited to address their functional significance in MAPK signaling in vivo. Total RNA from exponentially growing PC12 cells, rat cerebellum, mouse cerebrum or spleen was purified using RNazol B (Campro Scientific, Veenendaal, The Netherlands). RT-PCR analyses were performed essentially as described . Briefly, cDNA was synthesized from total RNA by random hexamer priming using SuperScript™ II RNase H-Reverse Transcriptase (Invitrogen Life Technologies, Breda, The Netherlands) and used for PCR. Amplified products were analyzed on agarose gels. Primers used are: PCPTP1-forward 5'-CCTCAATGCACACACTATGAGG-3'; PCPTP1-Ce-forward 5'-CTTCAGCTCGCAGGC TTTC-3'; PTPPBSγ (rat)-forward 5'-GTGCAGGACGTGGAGGAAG-3'; PTPRR-reverse 5'-TCCTTCTTTGCTCCAGAT-3'; STEP-forward 5'-GAGGACTACCGGCTGCGAC-3'; STEP-reverse 5'-GGCTCATGGCGTGGTGCAC-3'; HePTP-forward 5'-CATCTGCTCAGT GAACACACC-3'; HePTP-reverse 5'-GTCTGCTACAGTGTTGGGC-3'; β-actin-forward 5'-GCTAGAGCTGCCTGACGG-3' and β-actin-reverse 5'-GAGGCCAGGATGGAGCC-3'.